High-Tech Looking Cuisinart Popcorn Popper Is Fit For Any Gadget Lover's Kitchen | OhGizmo! 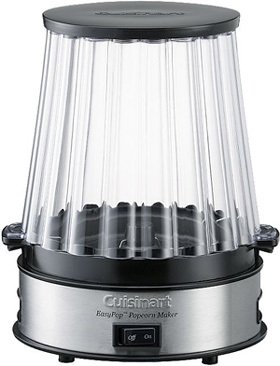 Sure, this slick looking popcorn popper from Cuisinart is just another example of style over substance when it comes to kitchen gadgets, but that’s not stopping me from wanting one, even with a cupboard full of microwave popcorn. The brushed stainless steel finish on the base is always a good choice, and the built-in ventilation system and stirring mechanism ensures even heat distribution for the kernels. In fact, it can make about 10 cups of popcorn in just 5 minutes. It also features a large acrylic see-through dome that not only allows you to watch the magic of ‘popping’ in action, but it also doubles as a handy serving bowl when inverted. On the downside, this does seem to be a hot oil popper instead of a hot air popper, so you’ll need to add oil and deal with a little bit of clean up afterwards, but the removable non-stick cooking plate should make that somewhat painless. You can get it from Crate and Barrel for $69.95. I have one of these and it's great! The removable cooking plate is dishwasher safe, which was the major selling point for me, and what makes it far superior to the West Bend or other old-school stir poppers, at least in my book. Also, I found this at Fry's for at least $10 less than the price mentioned here.